A good way to begin painting eyes on a 3-dimensional object is to first draw an eye on paper, using a pencil or charcoal or even colored pencils to get a feel for where you want shadows and depth. I start off by painting the entire eyeball with a couple of coats of gray paint. 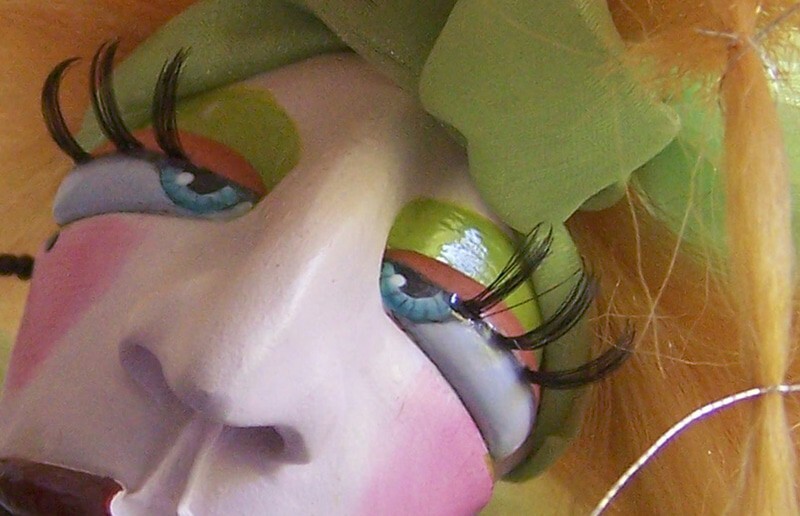 Next, I paint the eyelids in a bright color or a shade that is slightly darker or lighter than the skin tone of the sculpture. (I usually have to go back and touch them up). I then paint the pupil, starting off with thinned paint until I get both pupils to look like they are looking in the same direction. Drawing the pupil and iris with pencil first can be helpful. 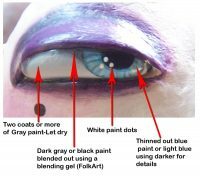 Pick a color for the iris, thin the paint to a light wash and paint around the pupil, working to get both eye as close to the same as possible. 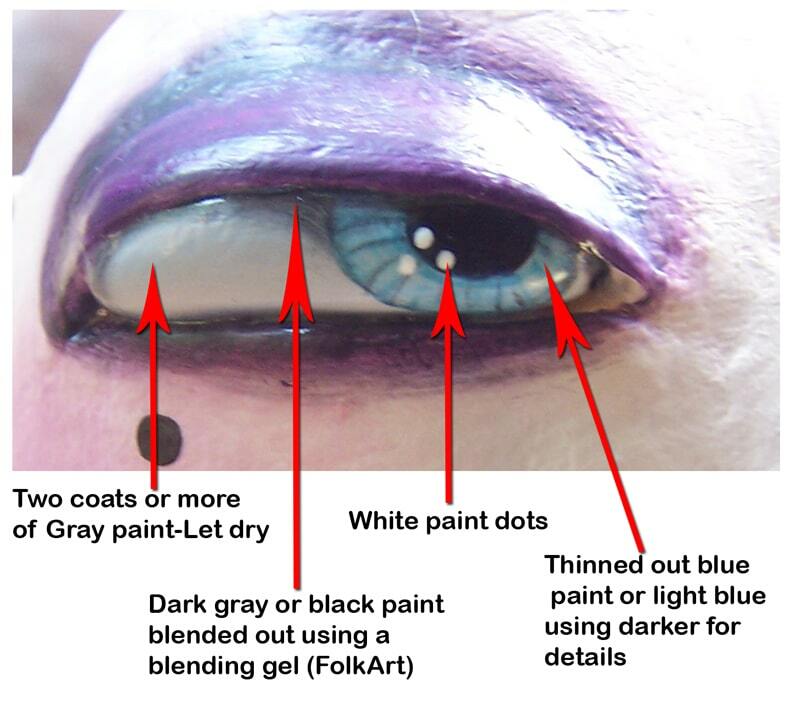 I then use a blending gel, dark gray paint or black and add shadows under the eyelids as well as under the eye. The white reflected light dots can be put anywhere on the eye and as many or as few as wanted. Any shape as well. Lastly, I put a high gloss on just the eyes and of course, never forget the false eyelashes! “I live in Florida, a state that lends itself to outrageous colors and creativity. I’ve been making art dolls off and on since the late 80’s. Self-taught at a kitchen table littered with kids homework papers and cookie crumbs. It evolved into a nice little business for a time. Now, my focus is on learning different mediums and techniques and mixing them up like a mystery stew. I hope I figured this out and am able to successfully send you a picture of my Boxer sculptures. It’s a learning experience for me, the cell phone/computer I mean. Thanks again so much for sharing your knowledge. Sorry, Stephanie – your image didn’t come through. But we would love to see that Boxer. The problem is usually caused by images that have been saved in too big a size. You can usually set a camera to save photos in sizes for the Web, or you can use this free tool to make your images smaller. Or – if you upload your image to another page (Facebook, maybe?) where people could see them, you could just give us the link to it. I do hope you’ll try again! I did try to resize the photo, but I guess I’ll have to practice a bit more. I posted the photo on my Facebook page, Stephanie Libra. I hope you get to see them, there’s 10 in the photo, I’ve made 18 total. I started making these paper mache sculptures about a year ago after watching Jonni’s tutorials. I’m having a great time creating sculptures of my Boxers. I spend most of the winter sculpting, it makes the time go by fast. Thank you so much for expertise and for sharing! Stephanie, did you try to upload a photo of your Boxers? If you did, the file size was too big – but I hope you’ll try again. You can make the images smaller here. I would love to see your sculptures! I love your work. I could spend all day looking at your ladies! Thank you you brightened up my day! Jonni, how long do you need to dry a sculpture in the oven? I know it would depend n how big/thick it is but generally how long? Really creative, thank you for sharing. I popped over to your blog and had so much fun looking at your “Ladies”. What a hoot! Thanks for sharing your work here. I now know where to go when I really NEED a chuckle…or two…or ten. Thank you! It is always so great when people share their knowledge with the rest of us. I’ve seen your dolls before and have always thought they were fantastic! Love your imagination! Thank you Terry! The best part of this blog is all the sharing that goes on!